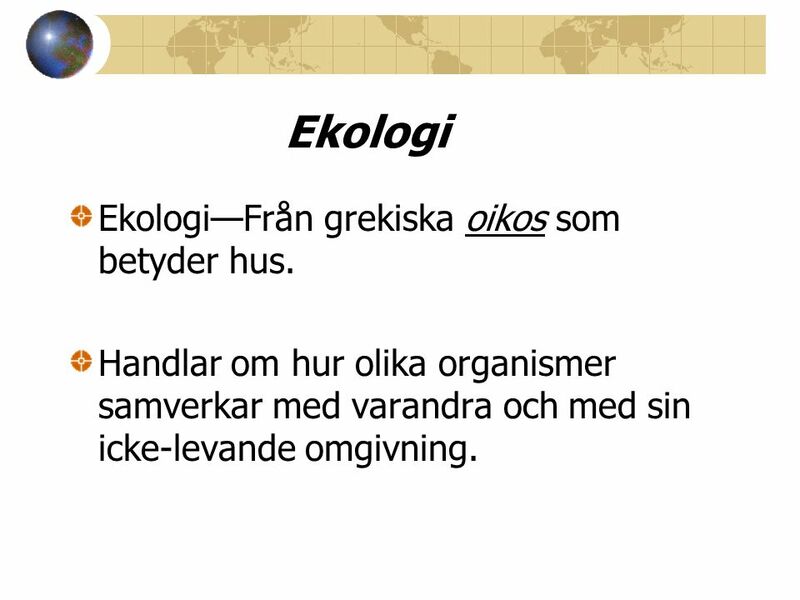 2 Ekologi Ekologi—Från grekiska oikos som betyder hus. 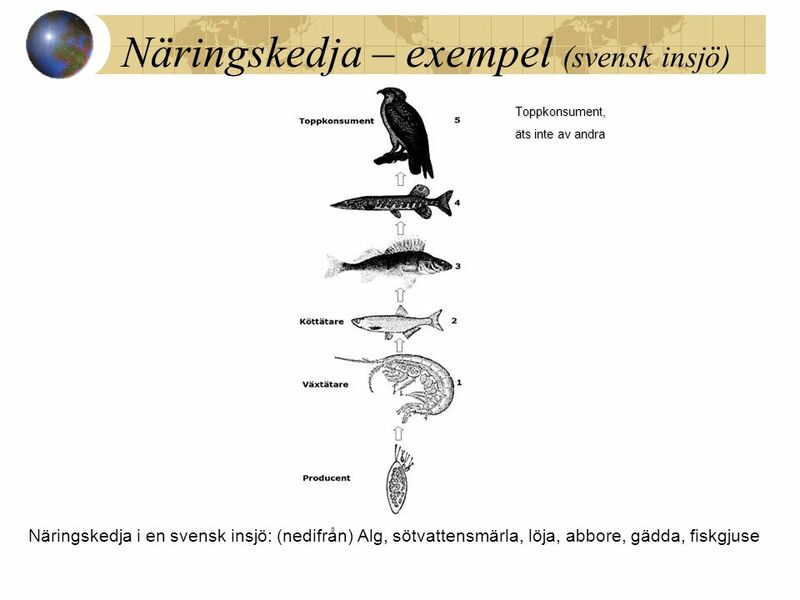 Handlar om hur olika organismer samverkar med varandra och med sin icke-levande omgivning. 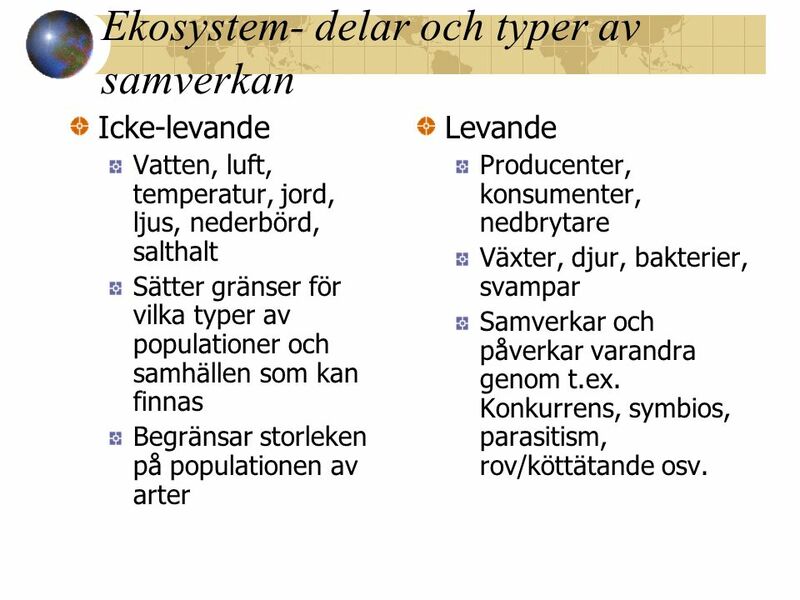 Icke-levande Vatten, luft, temperatur, jord, ljus, nederbörd, salthalt Sätter gränser för vilka typer av populationer och samhällen som kan finnas Begränsar storleken på populationen av arter Levande Producenter, konsumenter, nedbrytare Växter, djur, bakterier, svampar Samverkar och påverkar varandra genom t.ex. 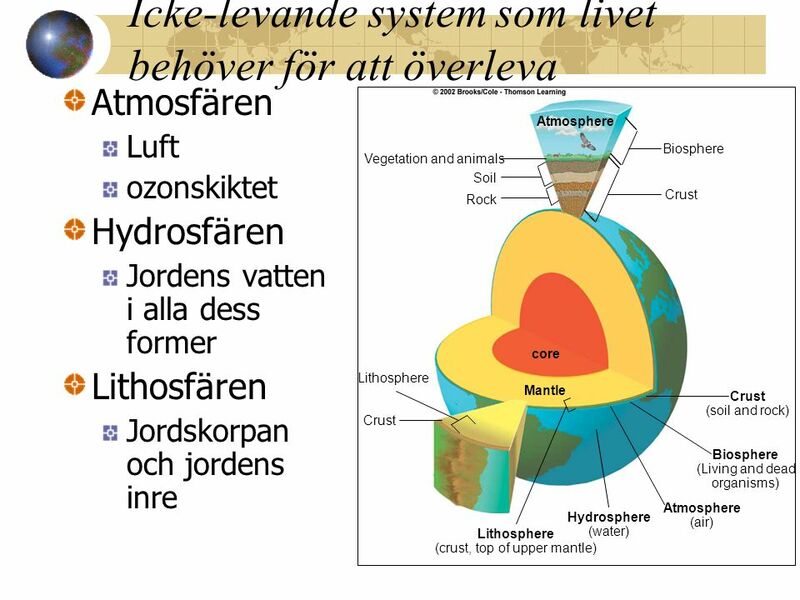 Konkurrens, symbios, parasitism, rov/köttätande osv. 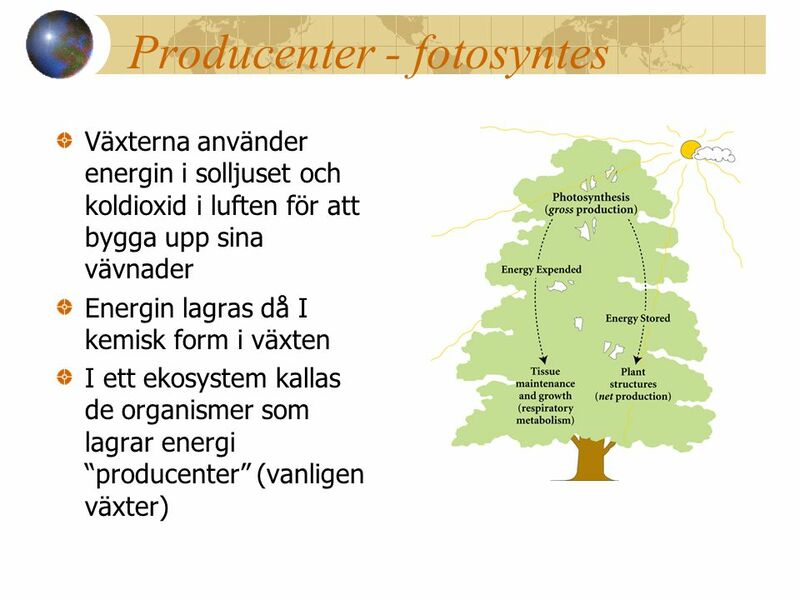 Växterna använder energin i solljuset och koldioxid i luften för att bygga upp sina vävnader Energin lagras då I kemisk form i växten I ett ekosystem kallas de organismer som lagrar energi “producenter” (vanligen växter) Primary Production in Plants The total production of organic compounds by plants is referred to as primary productivity or production. This represents the total amount of light energy transformed into chemical energy through photosynthesis. Only about 1 – 5 % of the solar energy in any given location actually is captured for use or storage by plants. 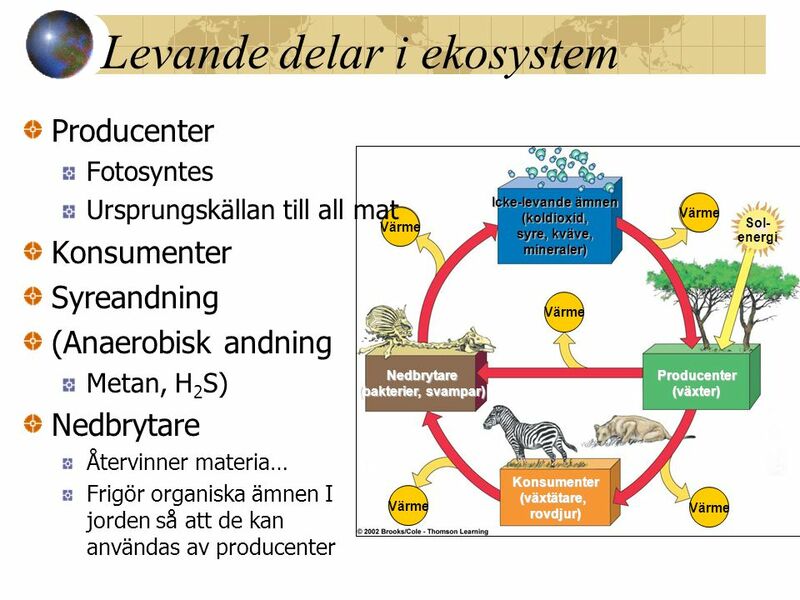 After the metabolic requirements of producers (plants or other photosynthetic organisms) are met, the total energy (accumulated as biomass) available to be passed through the food chain is called net primary productivity. References: Campbell, N.E., & Reece, J.B. (2002). Biology,(6th ed.). San Francisco: Benjamin Cummings. Raven, P.H., & Johnson, G.B. (2002). Biology, (6th ed.). McGraw-Hill. Image Reference: Baylor College of Medicine, Center For Educational Outreach. (2004). Martha Young, Senior Graphic Designer. Carbon, in the form of carbon dioxide, comprises about 0.03 percent of the atmosphere. Worldwide circulation of carbon atoms is called the carbon cycle. 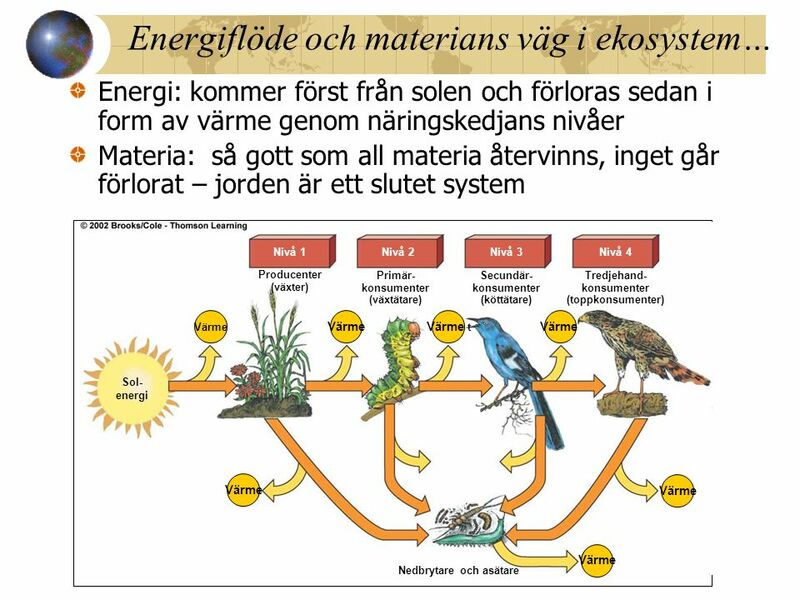 Since carbon becomes incorporated into molecules used by living organisms during photosynthesis, parts of the carbon cycle closely parallel the flow of energy through the earth’s living systems. 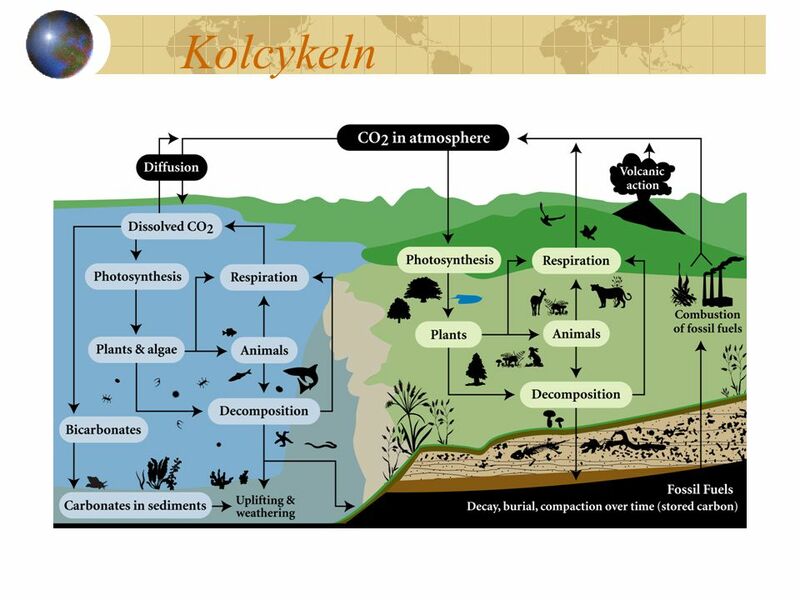 Carbon is found in the atmosphere, the oceans, soil, fossil deposits and living organisms. 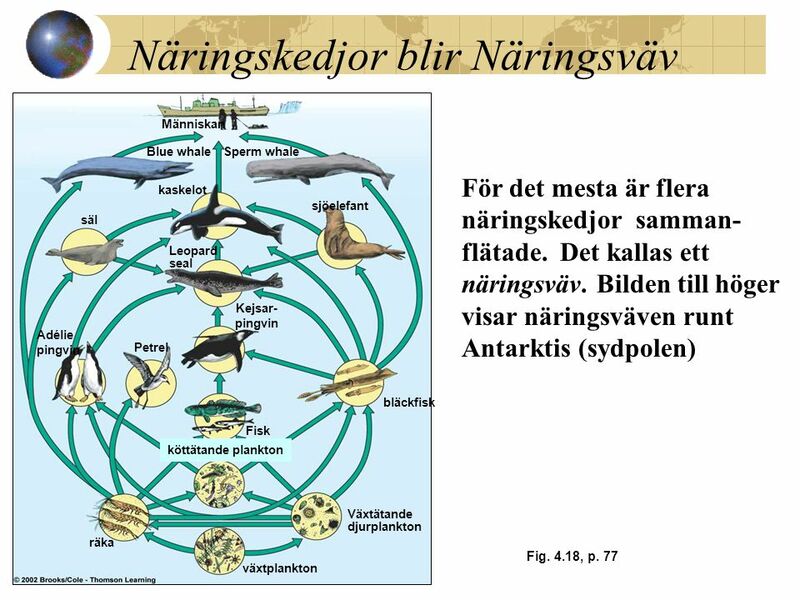 Photosynthetic organisms create carbon-containing molecules (known as “organic” compounds), which are passed to other organisms as depicted in food webs. Each year, about 75 billion metric tons of carbon are trapped in carbon-containing compounds through photosynthesis. Carbon is returned to the environment through respiration (breakdown of sugar or other organic compounds), combustion (burning of organic materials, including fossil fuels), and erosion. References: Campbell, N.E., & Reece, J.B. (2002). Biology,(6th ed.). San Francisco: Benjamin Cummings. Image Reference: Baylor College of Medicine, Center For Educational Outreach. (2004). Martha Young, Senior Graphic Designer. 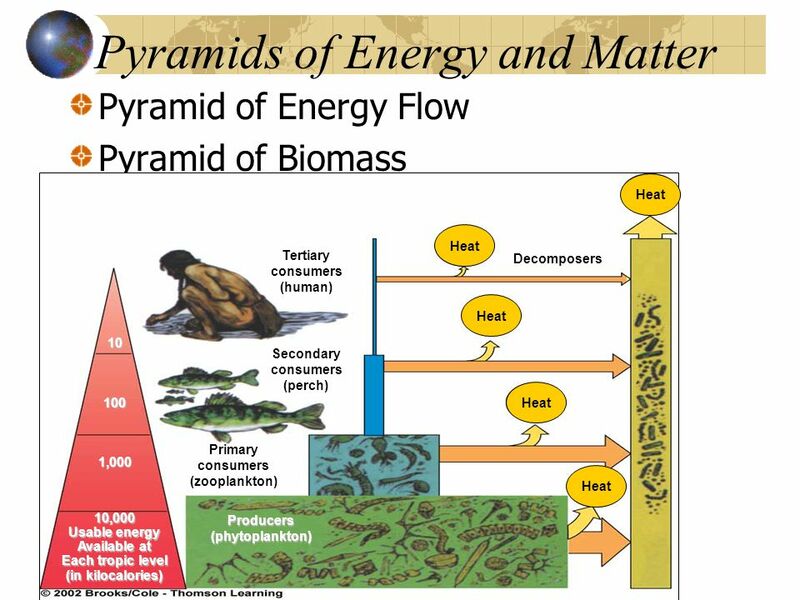 Ecological Pyramids of Energy Energy in ecosystems flows from producers (photosynthetic organisms) to consumers (herbivores and carnivores). 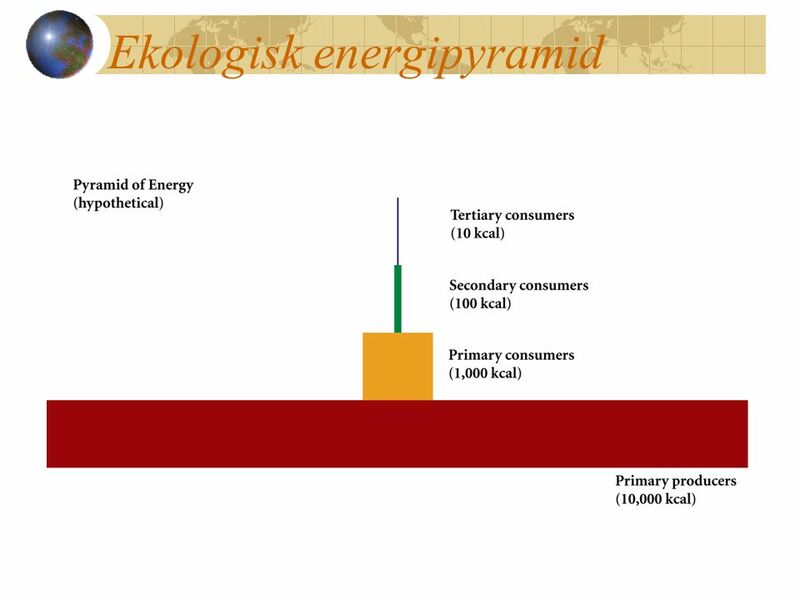 Ecological pyramids of energy usually depict the amount of living material (or its energetic equivalent) that is present in different trophic levels. In this diagram, energy is depicted in kilocalories. 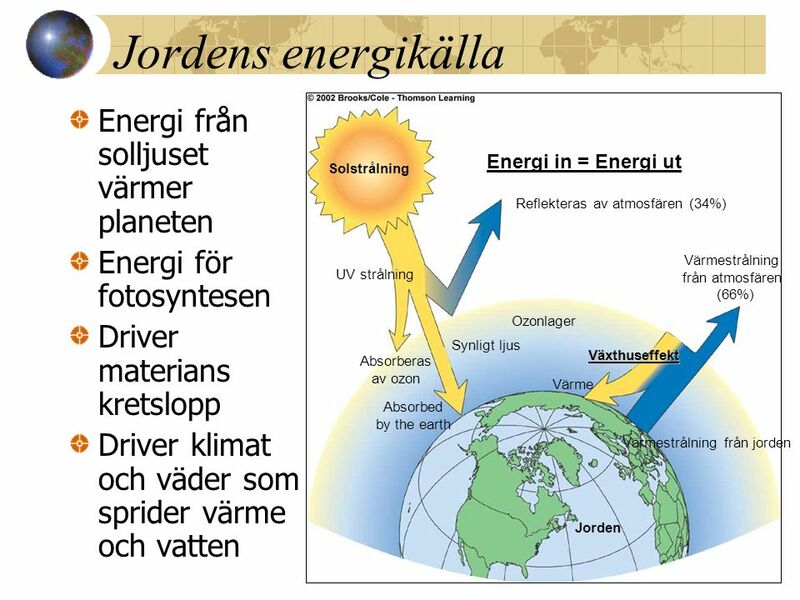 Primary producers convert only about 1% of the energy in available sunlight. 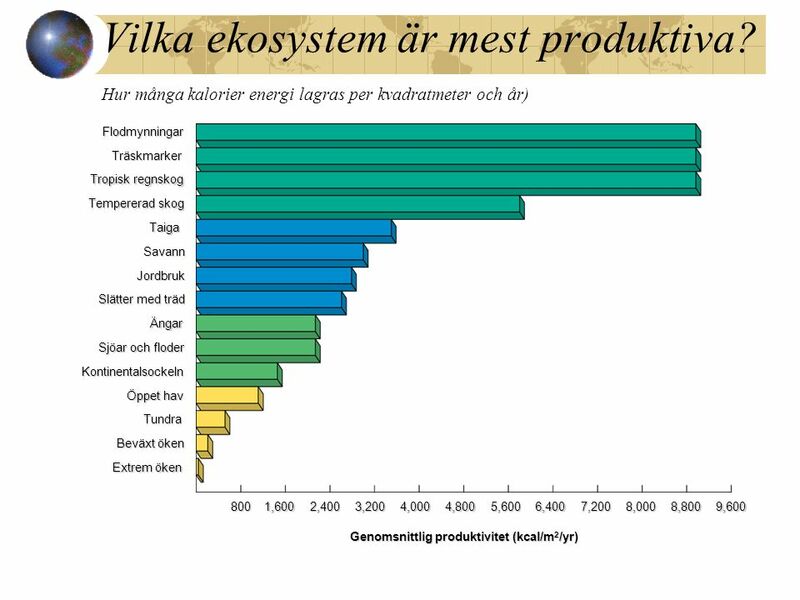 The average amount of energy that is available to the next trophic level is about 10%. 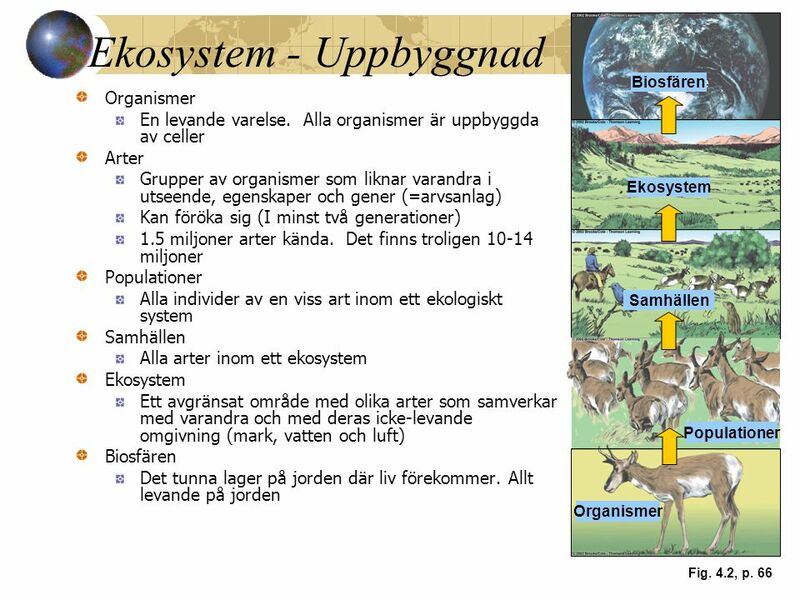 Because so much energy is utilized in building and maintaining organisms, food chains (series of feeding relationships) are usually limited to just three or four steps. Pyramids of energy can not be inverted. References: Campbell, N.E., & Reece, J.B. (2002). Biology,(6th ed.). San Francisco: Benjamin Cummings. Holligan, P.M., Harris,R.P., Newell, R.C., Harbour, D.C., Head, R.N., Linley, E.A.S., Lucas, M.I., Tranter, P.R.G., Weekly, C.M. (1984). Vertical distribution and partitioning of organic carbon in mixed, frontal, and stratified waters of the English Channel. Marine Ecology Progress Series, 14, Raven, P.H., & Johnson, G.B. (2002). 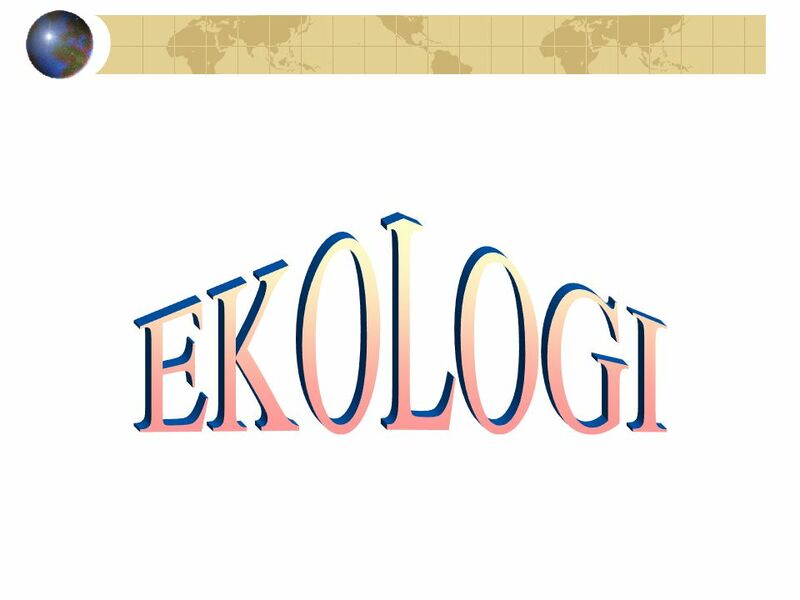 Biology, (6th ed.). McGraw-Hill. Image Reference: Baylor College of Medicine, Center For Educational Outreach. (2004). Martha Young, Senior Graphic Designer. 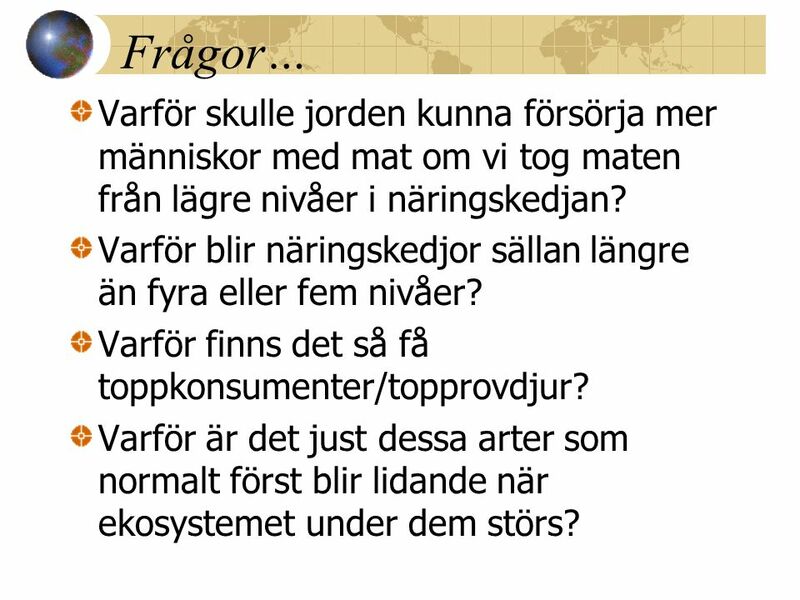 21 Frågor… Varför skulle jorden kunna försörja mer människor med mat om vi tog maten från lägre nivåer i näringskedjan? 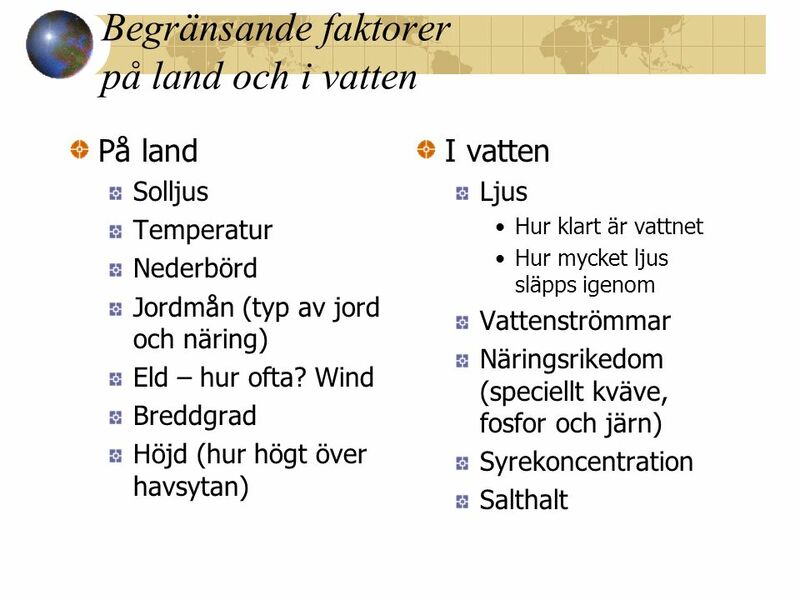 Varför blir näringskedjor sällan längre än fyra eller fem nivåer? 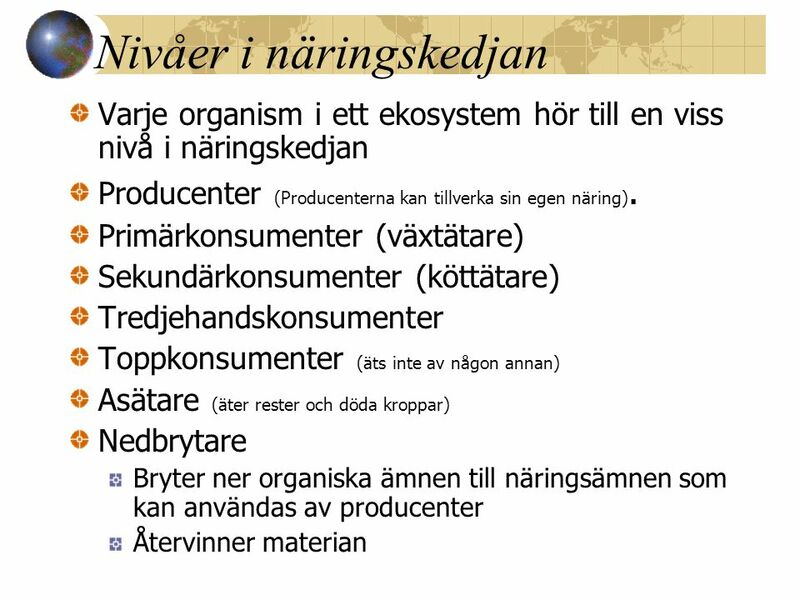 Varför finns det så få toppkonsumenter/topprovdjur? 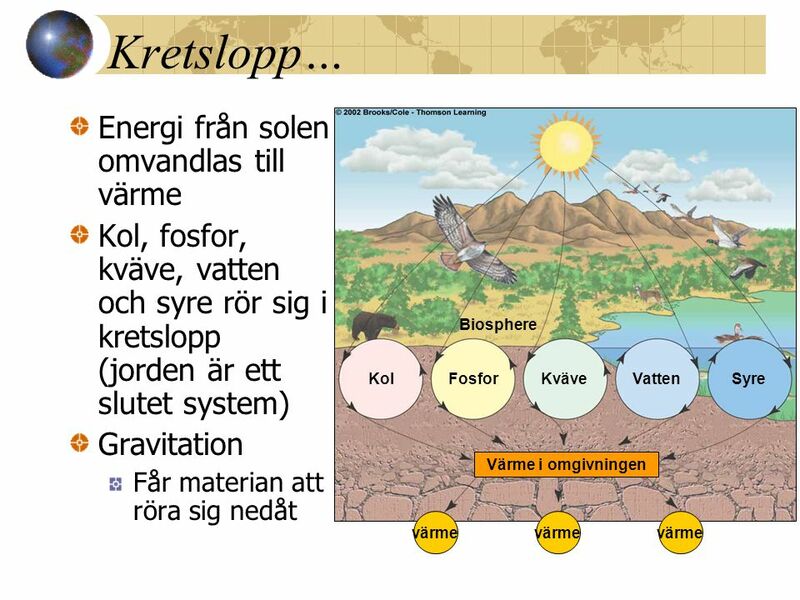 Varför är det just dessa arter som normalt först blir lidande när ekosystemet under dem störs? 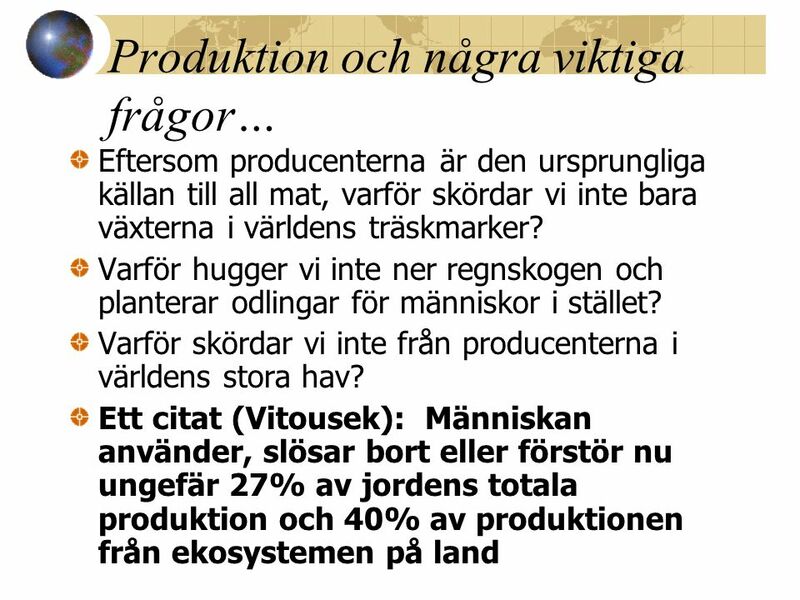 Ekologi År 8 Ht 14. 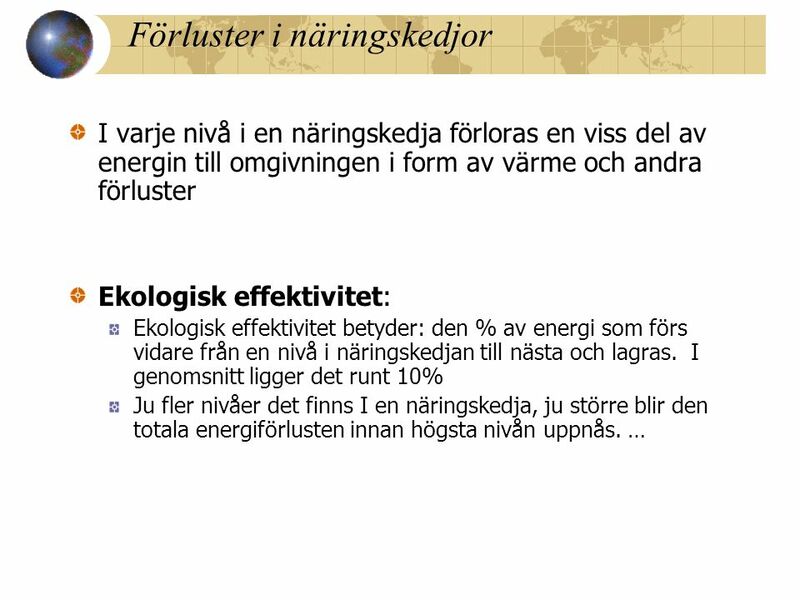 Ekologi – Nyckelbegrepp Fotosyntes Växternas energikälla Ekologi”läran om huset” Ekosystemsamspelet i naturen, avgränsad yta Individen.